I’ve enjoyed watching the BBC science fiction TV series “Torchwood” (a Dr. Who spin-off). I watch it on NetFlix, which means that I tend to see episodes long after they were originally broadcast. Last night I saw an episode from season three, originally aired in 2009. This wonderful season consisted of a single very long narrative spread over five gripping and well made episodes. But there was a technical detail that threw me completely for a loop. It’s a given that most scifi will introduce some sort of scientific element that does not actually exist in today’s world. This might be contact with an alien race, or a future technological advancement, or some as-yet-undiscovered human capability. Such premises are a fundamental part of the fun and interest of the genre. But it’s quite another thing if a work of science fiction violates its own premises. And that’s just what happens in the otherwise excellent third season of Torchwood. In particular, our intrepid Torchwood team employ a really nifty technology: Contact lens cameras. These handy little gadgets look exactly like ordinary contact lenses, but when you put them on, a remotely positioned colleague with a laptop computer can see everything you see. It turns out that there is a limitation: the lenses can see, but they cannot hear. The only way the remote operator can understand what a person is saying is if the cyber-contact lenses are looking at the person’s face. Then sophisticated image processing software can analyze the speaker’s lip movements, printing the now recognized speech as text on the laptop screen. Am I the only person who thinks there is something deeply wrong with this technology scenario? What is in there? I forget. It turns out that those neutrinos did not go faster than light after all. Researchers had not taken into account the fact that the atomic clocks on the orbiting GPS satellites used to measure the speed of the neutrinos were themselves moving with respect to the earth. Once that motion was accounted for, the apparent excess velocity disappeared. So cause and effect were not, in fact, dismantled, the universe did not cease to make sense, and the last hundred years of perfectly consistent empirical confirmation of Einstein’s special theory of relativity was not contradicted. In the end, the edifice of reality as we know it did not collapse violently in upon itself into a steaming incoherent heap of quantum ruin, physics did not come apart at the seams, and clouds of electrons did not spontaneously fly out from their atomic orbits, thereby instantly vaporizing you, me, all galaxies everywhere, and even the very possibility of a future beyond this moment. The incident does make for a good metaphor though. We each spend our lives trying to make sense of the people around us, but we forget that we ourselves are in motion. You and I may walk along together for a while, but ultimately we are in different orbits. So when trying to make sense of the world, it’s good to trust your inner atomic clock, but try to remember that your mileage may vary. The question that comes up clearly for me, after the rousing discussion on yesterday’s post, is whether meditation is a precondition for mindfulness. We all understand the concept of mindfulness — what Ram Dass refers to as “Be here now”. It is the ability to directly experience and enjoy the moments of your life, to see, hear, taste and touch what is around you, rather than needing to continually guard the gates of your psyche, and therefore remaining trapped inside your own internal emotional mindstorm. Openness to the people and experiences around us is certainly something that just about everyone wants. But is it literally true that meditation is to mindfulness as physical exercise is to strong and limber muscles, or (to cite an example with which I am familiar) as practicing the guitar is to mastery of the guitar? If we want to be able to experience our lives calmly and openly, letting experiences in without requiring them to be strained through a defensive filter, then do we need to devote a certain amount of time every day to meditation? Or can mindfulness be attained in any other way? I’ve begun to pay far more attention recently to the preconditions for getting done the things that we want to do. It seems that it’s not the world around us so much that affects how much we are able to keep our focus, but the world we create around us. The human brain is always running on multiple tracks — it’s the way we are constructed. While part of our mind is focused on whatever task is at hand, another is thinking back to that argument we had last week, or the restaurant we’ve been meaning to check out, or perhaps a dimly remembered moment from when we were five years old. Alas, it is all too easy to become distracted. Before we know it, our train of thought has jumped from one track to the next. Perhaps part of the pleasure of seeing a good movie or reading a great novel is the way it lets your mind luxuriate within a single track, without the constant decisions and shuffling of priorities you encounter in your real life. This may also be a reason that intense and highly focused situations, like mountain climbing or white water rafting, lead to powerfully positive memories and feelings of bonding. They force our minds to be in one place for an extended period of time, something most of us don’t get to experience all that often. But we can’t always be climbing a mountain or rafting down wild rivers. So how can we improve focus, and increase our ability to stay in the moment, in our everyday life? I’m open to suggestions. I confess, right off the bat, that I’m only in the middle of the first season, so there may be fundamental elements I’m missing. But even from what I’ve seen so far, “Breaking Bad” is incredibly exciting from a formal perspective. It has many of the elements of a superhero narrative, but from there everything is twisted just about as far as it possible can be. The main character is unquestionably an individual with superpowers. Specifically, he has an astonishing mind, capable of seeing patterns in the world around him and instantly creating new inventions in response. And he doesn’t do this the way MacGyver would, by making a fetish of an ability to improvise around household items. No, his innovations are instantaneous, innate, done with no more effort than it would take to punch in a phone number. He hardly seems to notice them. We’re talking serious superpower here. And yet our hero is as dysfunctional as it is possible to be. His life is careening off-course, and he is in deep psychological denial about everything, even about being in deep psychological denial. Best of all, the emotional scale is operatic, immense. The emotional range we experience through the eyes of this man is insane, grandiose, wildly overwrought, tripping in a single beat from elation to the knife edge of despair. We’re not talking Columbo or House or Monk, reliably working out the crime or disease of the week. We’re talking Puccini and Wagner, Macbeth and Othello, only somehow magically transposed to the suburbs of middle American. Make no mistake, this is a superhero narrative par excellence (albeit a new kind of superhero narrative). A protagonist with godlike supernatural powers in a struggle for Truth, desperately trying to hold onto his moral compass in the face of overwhelming odds. We don’t know how it will turn out, for him or for his world. So we tune in — breathless, appalled, delighted, and utterly transfixed. Still, Batman is highly traditional in certain ways. Unquestionably the boy tormented by tragedy has grown into a kind of uber-man — an unapologetic vigilante who believes thoroughly in himself and in his own brand of frontier justice. Even when the hero is dark, these comic books were pure wish-fulfilment fantasy. Even the most insecure teenager could project themselves into a fantasy version of adulthood — an individual who has overcome doubts and fears to be the modern version of a knight of old. Spiderman represents a far more radical evolution. Peter Parker is not Billy Batson being swapped out into Captain Marvel when danger comes calling. No, Spiderman the super hero is still a lonely lost boy, his self-doubt and insecurity highly visible, to the point of being a badge of identity. Stan Lee’s brilliant innovation was to project the insecurity of the reader onto the superhero himself. Which brings us to the inevitable next evolution in the superhero — “Breaking Bad.” More tomorrow. * Yes, Superman’s parents — and, in fact, his entire planet — were annihilated, but as a child he didn’t have to deal with that, and it never seems to have really bothered him. Sometimes something is so obvious that you can forget how important it is. Without air or water we would die. Without love and human contact, our souls would shrivel down to nothing. And without Dennis Ritchie, so much that we take for granted today would not exist. The idea that a computer program can be a thing of beauty and elegance, the seamless mixture of artistry and technology that we take for granted in everything from Google to the iPad to Kinect, the very language with which our modern world was built. It’s astonishing to realize how much we owe to the mind of one quietly brilliant man. 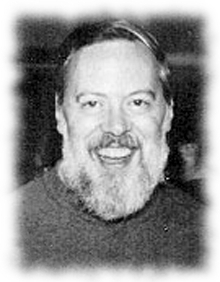 Dennis Ritchie passed away on October 12, 2011. He will be missed. When I was in college I read (in English translation) Genji Monogarati, or “The Tale of Genji”, a wonderful novel of imperial Japanese court intrigue written in the 11th century by Murasaki Shikibu. Her literary masterpiece was arguably the first novel, and it is completely absorbing not for what happens, but rather for the psychological insights and subtle shifts of power reflected in even the smallest conversations. It also takes place in a highly refined world, where any deviation from social convention is verboten. Not that people don’t act inappropriately, but rather it is dangerous to appear to act inappropriately. I am now watching Mad Men, and am struck by the similarities. There is enormous psychological conflict and tension beneath a veneer of absolute conformity to convention. Customs, manners, style of dress, social hierarchies, all are carefully adhered to, while just beneath the surface each character tries to reconcile this beautiful social prison with his or her own deep (and usually unmet) psychological needs. Here we are, in 21st century America, essentially experiencing “The Tale of Genji”, with the stylized world of 1960 Madison Avenue standing in for the high court in Edo. It would seem that the novel has gone full circle. You are currently browsing the Ken’s Blog blog archives for October, 2011.